This fabulous Coffee to go! cup cozy is perfect for giving your hands extra protection from the heat of the cup. 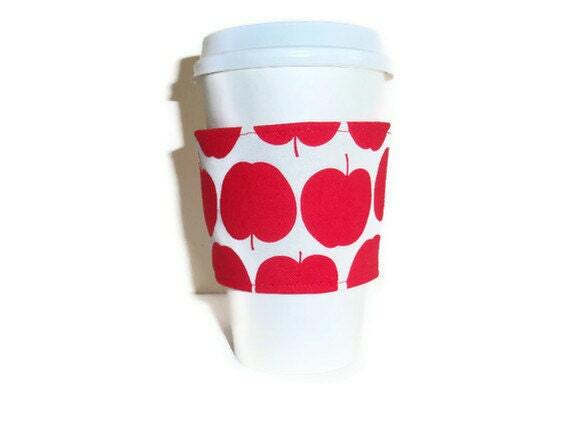 Crafted in 100% kokka cotton from Japan with a design of bright red apples on a cream background. The inside of the holder is a design of white stars on bright red background. Have also added 2 layers of interlining to give a padded feel and act as insulation. I have photographed the cozy on a Grande size take out cup. Dimensions: 7cm(2.75in) high by 9cm(3.5in) diameter at the top , 7cm(2.75in) diameter at the bottom. Super Easy Beginner Crochet Project for the 4th! Crochet Cable Stitch Coffee Cozy in Eggplant.